November sky. It lightens the evening chores. Well, Thanksgiving is upon us. This year we can count on one hand, once again, the ingredients in the dinner that will come off farm, and we are quite proud of that. Since we’ve not posted in a month you can imagine that we’ve been busy. More goat breeding, some of it unintended, has taken place, we’ve been learning to manage hogs behind a wire, illness swept through the house, more of the garden has been put to bed, some winter greens have been tended, and a great deal of construction has been going on. 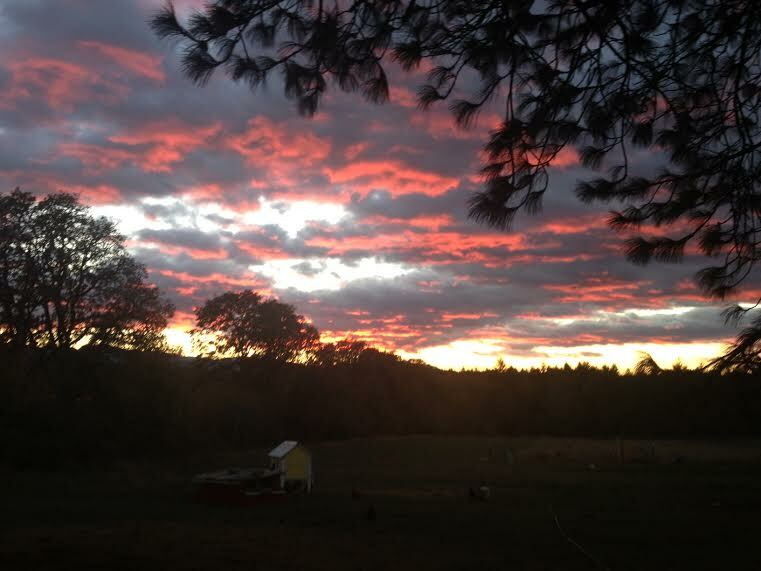 In the midst of all of this we were struck by a thunderbolt of clarification about our future direction and land use. The rooting of our pasture by the hogs has been an astonishing surprise – what they can do with their noses is extraordinary. They tear up with ease turf that I would need to work with pick and shovel and sweat. So our current plan is to divide the pasture into four paddocks – which we are currently in the process of doing – and we will run goats in one paddock, follow them with chickens, then send in hogs that we will run with a few more chickens (the hogs when they root dig up worms and the smarter hens run with them to gobble them up). After the hogs we’ll hand sow pasture seed and let it lie fallow. 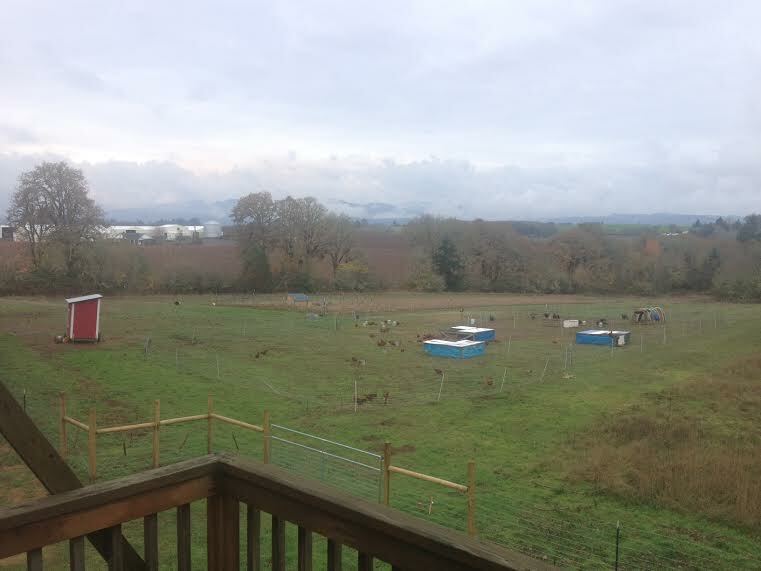 Our pasture with our broilers, turkeys, layers, and hogs. Slowly but surely we are learning to manage it, and to see what it will support. In conjunction with this we had another epiphany. We harvested two of our more problematic goats and had a wonderful dinner of goat chops from them. The taste was identical to lamb, although a bit fatty – our fault for over-feeding them. But the upshot is that, while we will run dairy goats in order to have the milk for our hogs and produce high quality pork, we are going to be getting a Boer buck this year and breed him to our girls next fall; by spring 2015 we should be producing meat goats. We’re all happy about this because it means we don’t need to learn sheep, and learning another animal that is, in fact, more difficult to figure out is not something any of us are interested in at the moment, given how much we’ve taken on. Greg is the unofficial Mayor of Pleasant Hill, and has been extraordinarily generous with his help over the past 18 months since we got up and running. Here he helps to give some scale to our enormous birds. 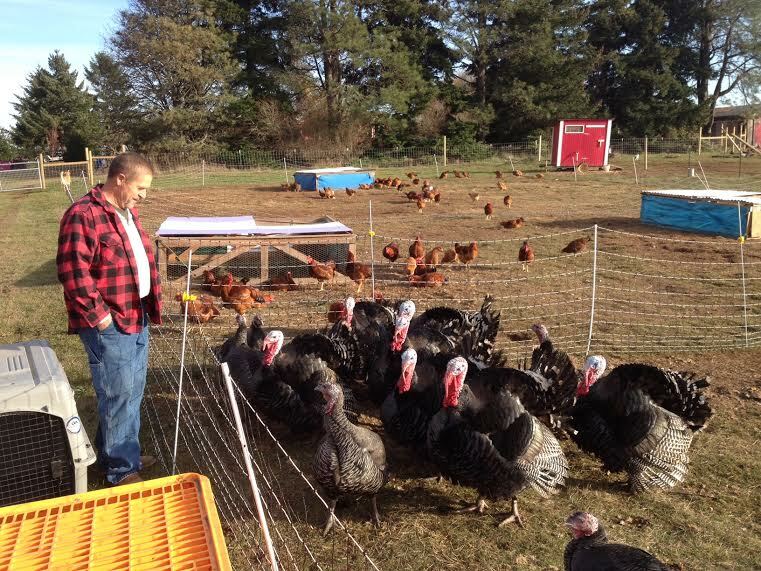 Of course, the big event in the past month (well, the past week; okay, the past 48 hours) was the turkey harvest yesterday, which actually started on Monday. We had to get all of our cages together and load them into the truck to make sure they would all fit (next year I have vowed not to do this – we will put the turkeys directly into the truck and fit it with a cannope). Our neighbor Greg came from across the street and he offered his forks on his tractor to help lift the turkeys onto the truck early the next morning. At 6:30 the next morning we went out, flashlights in hand, and first grabbed the toms since they were the largest, then the hens, and wrangled them into the cages and kennels. Turkeys are not like chickens – they are too big to run fast, pretty docile, and easy to catch, but their wings if they hit you can be pretty painful. Our method of wrangling is to throw a blanket over the bird, pick it up and heft it into its cell. The process for 12 birds didn’t take much more than 15 minutes – Biff Pow Oof done! We had five toms in the big cage, two toms in a kennel, three hens in another kennel and two hens in a small plastic poultry transporter. The kennels and transporter we could lift onto the truck, but the cage had to be set on a pallet; Greg came over at around 7 am and he helped lift the pallet onto the truck. Then all we had to do was to wait. I went to the bank to grab some cash (our poultry processor gives a discount if you pay with cash), then trucked off to the processor. The appointment at this particular processor needs to be made many months, preferably a year in advance. In these parts there are several “crazy times” for food producers. I’ve learned not to go into wine supply stores in September and October for example. For poultry processors November is the busiest time – everyone harvests their birds then. This year I made the appointment in June, even before we had the poults, and yesterday I made the appointment already for next year. There was a bit of a queue when I arrived at Mineral Springs Poultry, but the wait wasn’t bad. We are lucky to have such a good operation, for poultry so close, and the folks who run the operation are friendly and excellent at what they do. I’ve learned to hang out there while our birds are done; it’s a great way to meet more experienced greyhorns, and I’ve learned a great deal about farming, raising poultry, and just meeting some great people while waiting for birds to be harvested and prepped. Yesterday nearly everyone, myself included, had the same type of turkey – bronze broad breasted; the wait wasn’t bad because there were some interesting people to chat with, including a former physicist turned farmer who was originally from Wales. 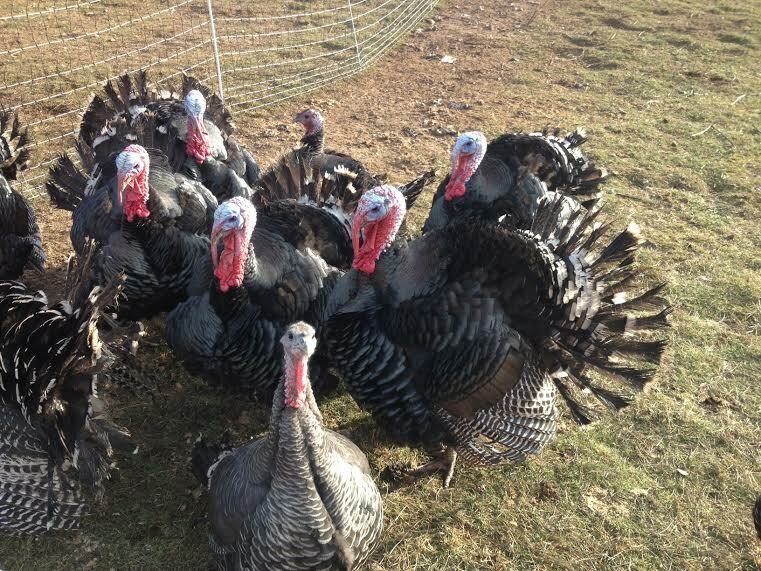 All of the old hands swore by bronze broad breasted, but everyone had the same complaint: the last hatching at most hatcheries is early to mid July, which means, if you want fresh turkey for Thanksgiving you end up with an oversized bird. The preference would be to have the poults in early August and save on feed for the sake of cost conversion ratios. The standard selling price, too, was a bit of an issue: most were selling at $4.25 a lb., and the concern is not so much the cost per pound as the size. Too large of a bird at that price appears a bit prohibitive to some. Once our birds were off the truck I took the cages back home. We did not have the room for both coolers and cages, so I had to take the cages back to the farm and pick up coolers that we had bleached out and filled with ice the night before. I also had to pick up Nancy, since we decided the two of us would deliver the turkeys to clients. While I was loading the truck at the farm and picking her up I got a phone call from Mineral Springs: our turkeys were too big for their shrink wrap so they had to repackage them in polythene. Fine I said! When Nancy and I arrived some 15 minutes later they were already loading our tubs with our turkeys. The smallest dressed weight turkey weighed in at 22 lbs., but most were in the high 30 range, with a couple of toms in the 40s, for a total of (drum roll please!) . . .
of turkey. All but two we had cut in half. We packed them on ice, and then were off. We delivered in person to eight clients for a total of 11 turkeys, with the twelfth kept for us. It took us the better part of three and a half hours to make deliveries in Willamina, Sheridan, and McMinnville, in part because each stop constituted a social visit too – never a bad thing, and a great chance to catch up with people and wish them a happy holiday. Today we spent cooking much of the dinner for tomorrow – our own mashed potatoes, our own sweet potatoes (a minor miracle that we grew some successfully in the Willamette Valley! ), our own giblet stock for gravy, our own pumpkin pie with our own eggs, milk, and sugar pie pumpkins, and tomorrow our own turkey, washed down with our own home brewed cider. All o this constitutes a minor miracle for a former associate Classics prof, an investment advisor, and a recent New England transplant. I think it explains the phrase, Amen! And now, tonight, we will hold our breath and hope: we hope that our turkeys are as good as last year; we hope our clients are happy with the quality of the meat; we hope that the sacrifice of our friendly and chatty gobblers that we have enjoyed most of the summer and fall on our pasture is honored with the name given to tomorrow, with Thanksgiving.